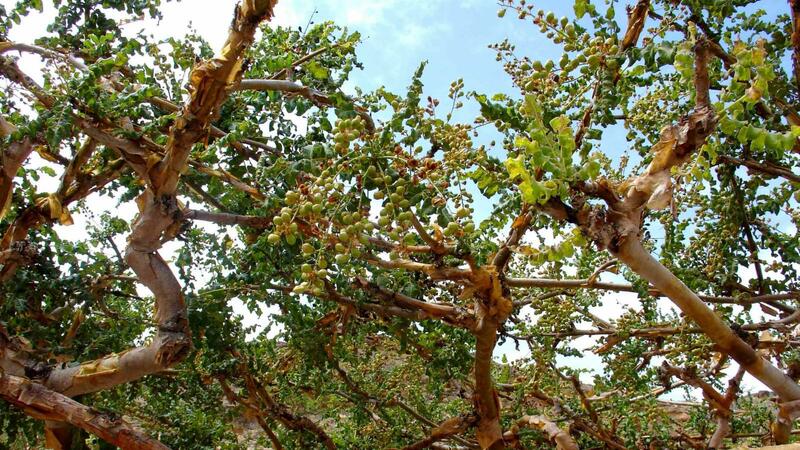 Boswellia sacra is a tree with papery, peeling bark and leaves clustered at the ends of tangled branches. It is the source of the oleo-gum-resin frankincense, which besides other uses, has long been valued for its sweet-smelling fumes when burnt. The name 'frankincense' is derived from the Old French 'franc encens', meaning pure incense or, more literally, free lighting. 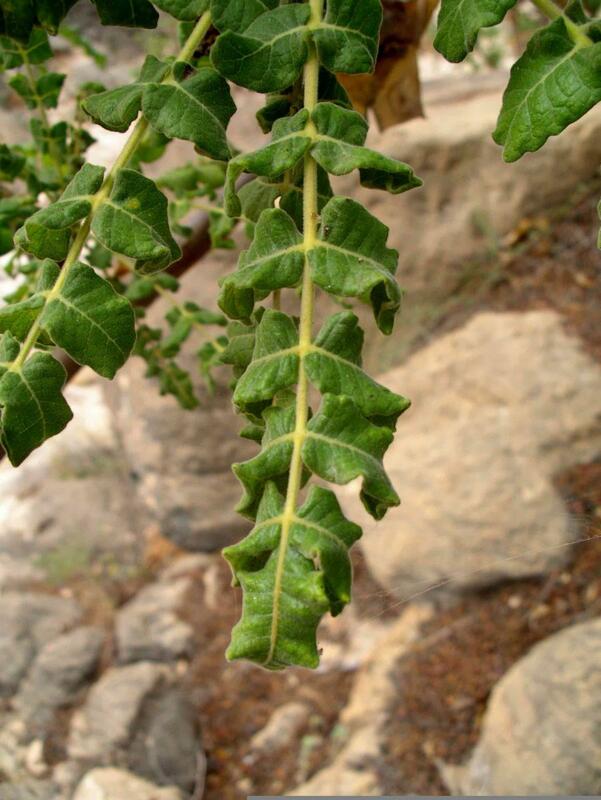 Trade in frankincense, which is produced by various trees in the genus Boswellia, dates back to at least 2000 BC. Up until the 1830s, many Europeans mistakenly believed that frankincense was the resin of a species of Juniperus, a conifer. Frankincense is strongly associated with Christmas, being named in the Bible as one of the three gifts brought to the baby Jesus by 'Three Wise Men' from the East, and has been used for thousands of years in many different cultures. The ancient Egyptians believed frankincense to be the sweat of gods, fallen to earth. The legendary Phoenix bird was believed to build its nest from twigs of frankincense and to feed upon 'tears' of the resin. Native to Ethiopia, northern Somalia, south-western Oman and southern Yemen. It is most widespread in northern Somalia, and in the woodlands of the escarpment mountains of the southern coast of the Arabian Peninsula. These coastal mountains are blanketed in thick fog during the summer months, allowing the development of dense woodlands supporting a surprisingly rich flora: a 'fog oasis' in a desert region. 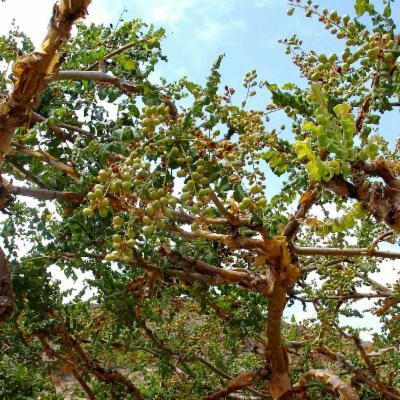 Overview: Boswellia sacra is a tree growing up to 8 m tall with papery, peeling bark. Trees are normally multi-stemmed, but can also have a single trunk. All parts of the tree are highly resinous. Leaves: The leaves are clustered at the tips of the branches and are divided into leaflets. 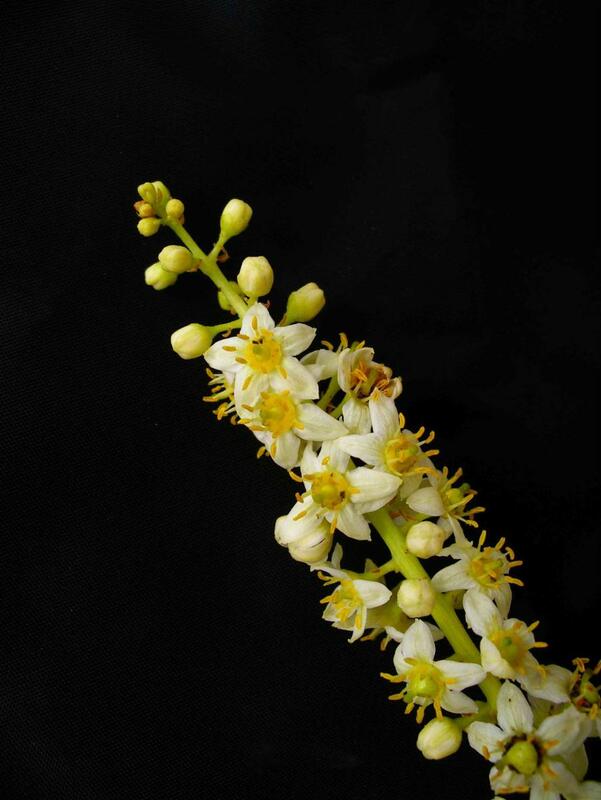 Flowers: The flowers are borne in axillary racemes up to 10 cm long, crowded together at the end of the branches. Each flower has five, spreading, yellow-white petals, ten stamens (male organs) and an ovary surrounded by a fleshy disc. The fruit is a 3-5 angled capsule of 8-12 mm, which opens by 3-5 valves. The trees cling to boulders or rock-faces by means of a cushion-like swelling at the base of the trunk. This swollen base helps to stabilise the tree and is most developed in those growing on very steep or exposed rocks. 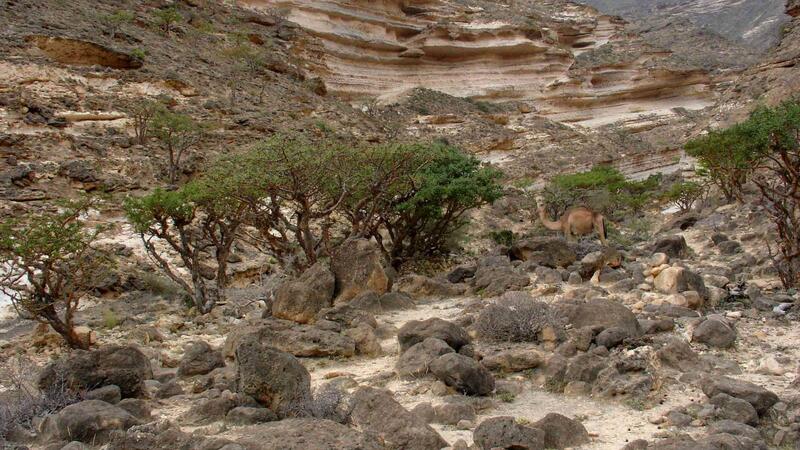 In Oman the tree is so heavily browsed by herbivores that it rarely flowers or sets seed, apparently leading to poor regeneration and the death of some trees. 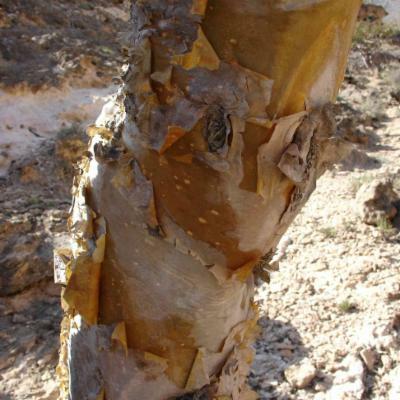 Frankincense and olibanum are commonly used names for the oleo-gum-resin of Boswellia trees. Frankincense has long been valued for the sweet-smelling fumes it produces when burnt. The ancient Egyptians used the resin in religious rites, in anointing the mummified bodies of their kings, and to treat wounds and sores. Incense containing frankincense was found in Tutankhamen's tomb. It is still used in religious ceremonies by the Parsees, thought by some to be cultural descendants of the 'Three Wise Men' (Magi) of the Christian tradition. The earliest recorded account of the use of Arabian frankincense and myrrh by the ancient Greeks comes from Herodotus, suggesting that by 500 BC a well-established trade existed between southern Arabia and Greece. In 295 BC Theophrastus recorded that Alexander the Greek (356-323 BC) sent Anaxicrates to southern Arabia to ascertain the origin of frankincense. Theophrastus (c. 372-287 BC), the Greek botanist, and Pliny the Elder (23-79 AD), the Latin naturalist, provided eyewitness accounts of the cultivation and harvesting of frankincense, and the methods remain largely unchanged today. 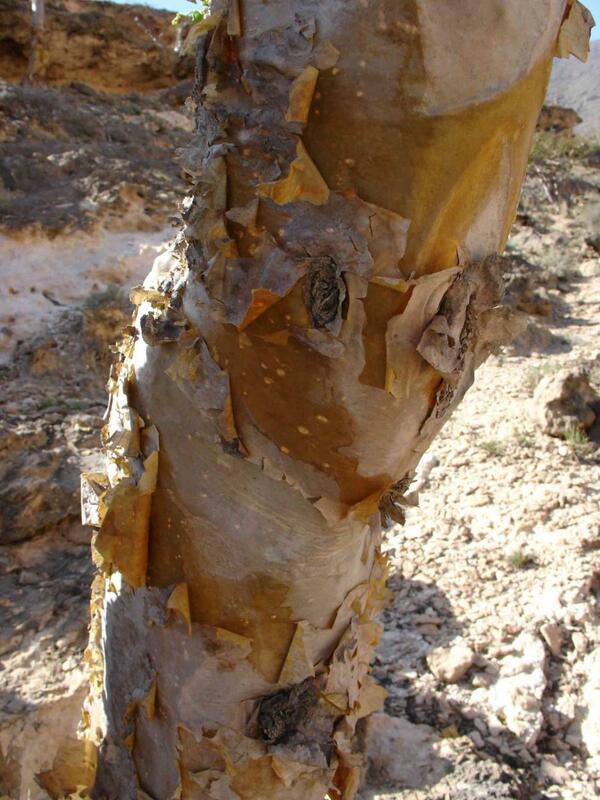 When slashed, the bark exudes an oily gum resin which is either scraped off the tree or collected from the ground as it drips off, a method which produces a better quality resin. The best quality resin is pale in colour, while resin which is scraped off the bark is reddish and considered inferior. 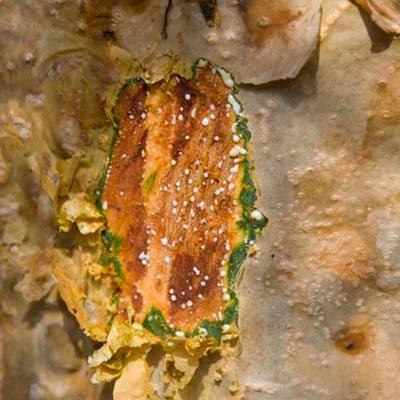 The frankincense tree begins to yield resin in its third or fourth year. Collectors make slight incisions or slashes in the stout lower branches with a special knife. The gum exudes at these points and hardens into a tear-shaped resinous substance. After about ten days the drops are large enough for collection. 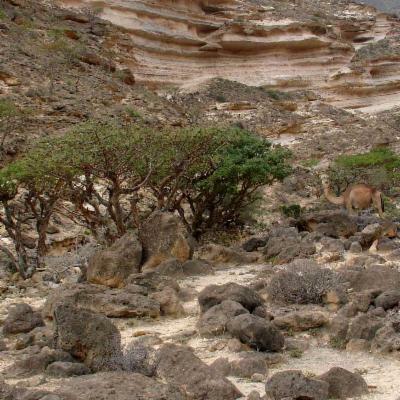 Frankincense is collected chiefly during the monsoon months, and in Oman (from where the best frankincense comes), is stored in mountain caves until the winter after the south-west monsoon is over. This delay enables the product to dry properly, though normally it can be ready for export ten to twenty days after collection. 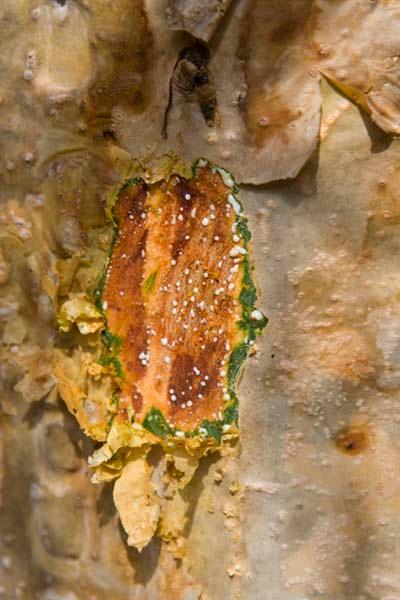 A single tree can yield several kilograms of resin each year. Today, frankincense is used mainly in the manufacture of incense, and is regarded as an essential ingredient. Incense is used particularly in Roman Catholic and Greek Orthodox Churches, and also in the cosmetics and pharmaceutical industries, for perfumes, fumigating powders and pastilles. Burning incense is an effective insect repellent. Frankincense has a wide range of traditional medicinal uses, for example in the treatment of digestive and respiratory complaints. 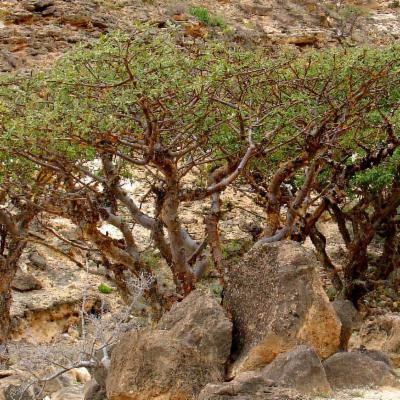 Scientific research is underway into the possible use of Boswellia species in cancer treatment. The essential oil derived from frankincense contains a number of monoterpene hydrocarbons, such as pinene and limonene, and is used in aromatherapy. The fumes can have a stimulant effect. China is the main importer of the gum. Boswellia sacra can be seen growing in the seasonally dry zone of the Princess of Wales Conservatory. 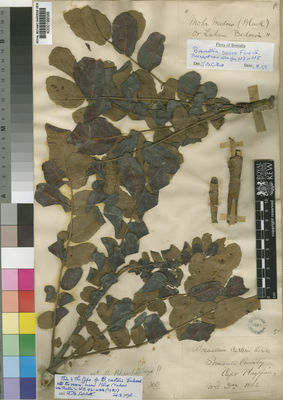 Pressed and dried specimens of B. sacra are held in the Herbarium, one of the behind-the-scenes areas of Kew. The details of some of these specimens, including images, can be seen online in the Herbarium Catalogue. Samples of gum, resin and oil are also held in the Economic Botany Collection. Desert-woodland; growing on rocky limestone slopes and gullies, and in the 'fog oasis' woodlands of the southern coastal mountains of the Arabian Peninsula. Near Threatened (NT) according to the International Union for Conservation of Nature Red List 2008 for Oman; Somalia; Yemen (South Yemen). On account of its mildly euphoric and stimulating effects, smoke from burning frankincense is classed as 'slightly hazardous' by the World Health Organization (WHO). 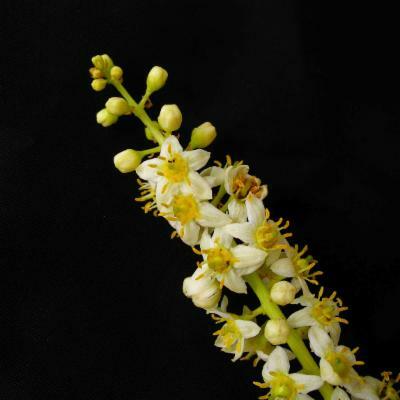 Swallowing the gum (olibanum) can lead to stomach problems. 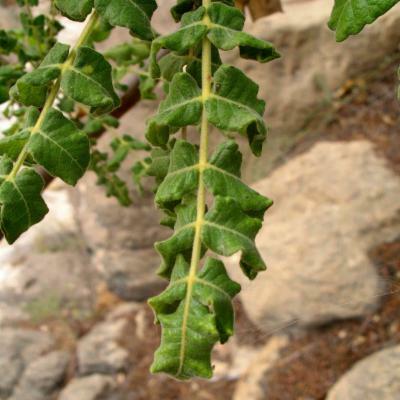 Frankincense has a long history of medicinal, religious and social uses. For example, in some Arab communities the gum is chewed to treat gastrointestinal complaints, but should not be swallowed (see below). Wink, M. & Van Wyk, B.-E. (2008). Mind-altering and Poisonous Plants of the World. Timber Press, Portland, Oregon and London. Thulin, M. 1998.0. 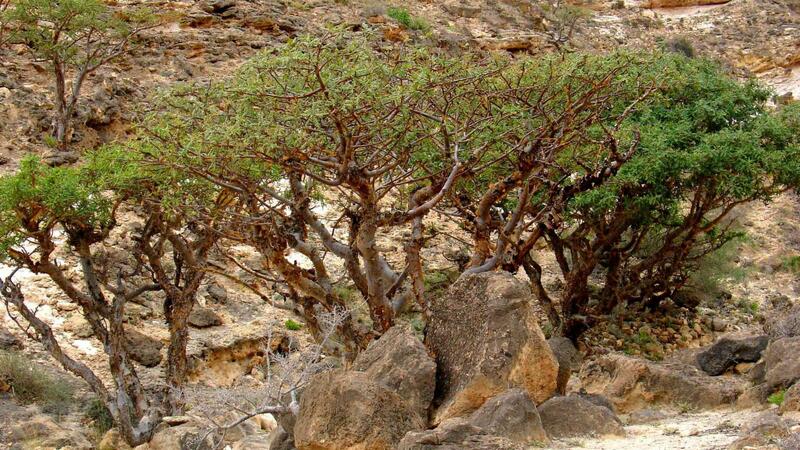 Boswellia sacra. In: IUCN 2010. IUCN Red List of Threatened Species. Version 2010.4. < www.iucnredlist.org>. Downloaded on 02 November 2010. SEPASAL database. Royal Botanic Gardens, Kew.